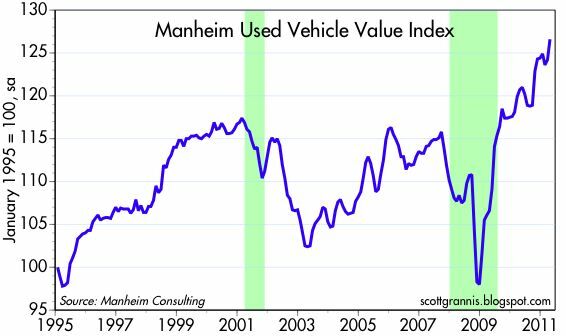 It's a good thing there's no inflation, otherwise used car prices might be on the moon by now. 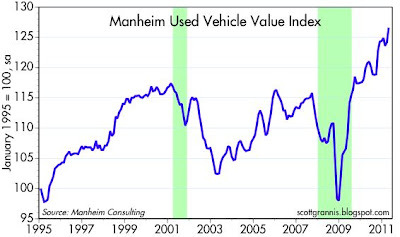 According to the Manheim index, used car prices have risen almost 5% in the past year, and almost 19% in the past two years. The reason? "Restricted supplies and strong retail demand." Cash for Clunkers; to bad if you are poor and need a cheap car. Happily, the world can easily manufacture more cars than consumers can buy. This is a blip--and the USA is a huge importer of cars. That's one reason why inflation is only a minor problem in the USA--we import labor, capital, goods and services profusely. The Fed is hard-pressed to print enough money to boost growth, let alone get us to inflation. This might be the ideal time to sell my 1986 Isuzu Trooper II, that I bought in 1990.
ive been in the market for 6 months looking at cars, and i have definitely noticed a jump by about 15-20% across the board. looks like i will have to settle for a lesser car, thanks bernanke.